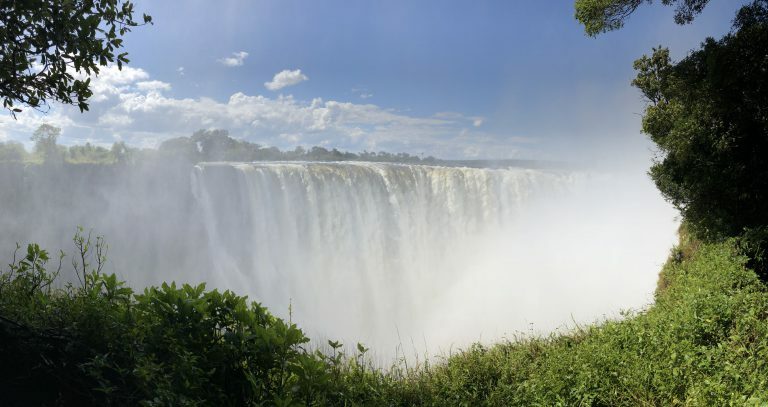 Travel Report: 15 days in Zimbabwe, Namibia, Botswana. Recommendations and Tips for Photographers and Travellers. Local currencies: Zimbabwe: “Zimbabwe dollars”, but US dollars are widely accepted and expected. If possible, take small USD bills for tip, which is also expected in USD. Botswana: Botswana Pula, but again USD is welcome in the lodges. Otherwise, credit card payment works smoothly everywhere. Vaccinations: Coming from Germany no vaccinations needed – even no yellow fever. However, the standard vaccinations are recommended, see suggestions Foreign Office. Malaria prophylaxis applies only to South Africa, here everyone has to weigh whether or not. Luggage: When traveling in Africa by light aircraft, you should pay attention to “soft” luggage (such as sports bags) and the weight limit (which is often not taken very seriously). The photo equipment should definitely be taken on board, so pay attention to cabin luggage (!) Helpful: A small pocket knife and a strong flashlight with spare batteries are often very useful. The cell phone flashlight does it too hard, but often does not shine far enough. What do we need to take with us? For this tour, the packing was fast. As always “onion principle” based functional clothing and sturdy shoes. Since it is “winter” in the countries visited in May, you should be prepared especially for the evening and at night, as well as the early morning for cold temperatures that can even go to the freezing point. In the lodges in Africa you can usually wash your clothes for free or for a small additional charge. You get them either the same day or the next. That saves a lot of luggage and weight. HAIDA (Polfillter, Graufilter und Verlaufsfilter). All together 15kg „Cabinluggage“ in a Lowepro Runner 450 (Backpack). Africa – Travel by plane. A dream for every Photo Enthusiast and Memories for life. Day 1: Departure: It goes from Munich via Paris, Zurich, Johannesburg to Victoria Falls (VFA). The journey starts with a first small disaster. The luggage has not made the first flight to Zurich. The Swiss on-board staff is great and provides us with cotton pyjamas, which in Africa may actually work as day wear ☺ Fortunately, we have not checked in the photo equipment and the rest can be purchased if necessary. So for now we enjoy the flight. 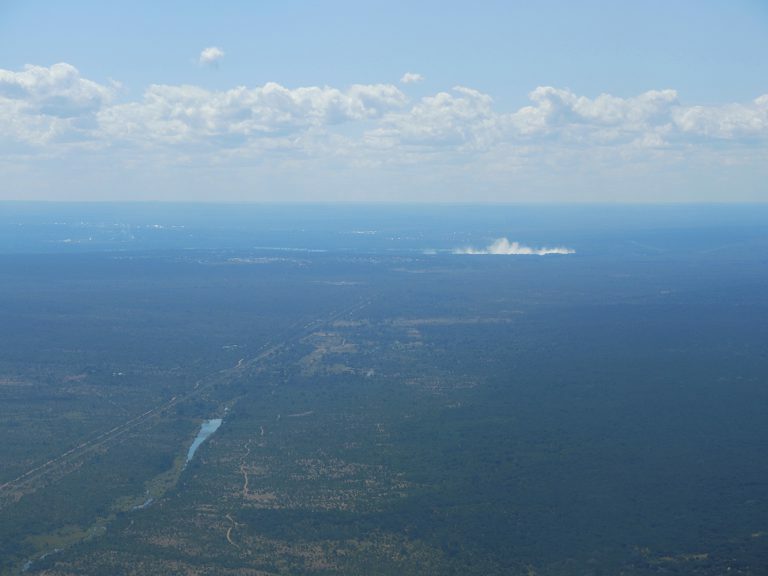 Day 2: On the approach to Victoria Falls you can see the Victoria Falls already with up to 500m high rising spray. The entry takes a felt eternity. We had only 10 people in front of us, but the visa officer needed a good 5 min per person. Too bad for the 240 people behind us. Small tip, Pens are in short supply – so always have it with you. The Kaza visa for Zimbabwe and Zambia is the same price as the Zimbabwe visa, so worth to go for it (about 50USD). After immigrations we went to the lost and found counter. At first we thought “ok, that will never work out”. But after 10 minutes we already had the first e-mail with all the luggage tracking data. At the exit stood our driver with name tag and off we went to the first accommodation. Batonka Guest Lodge. Hard to guess from the outside, a little paradise. 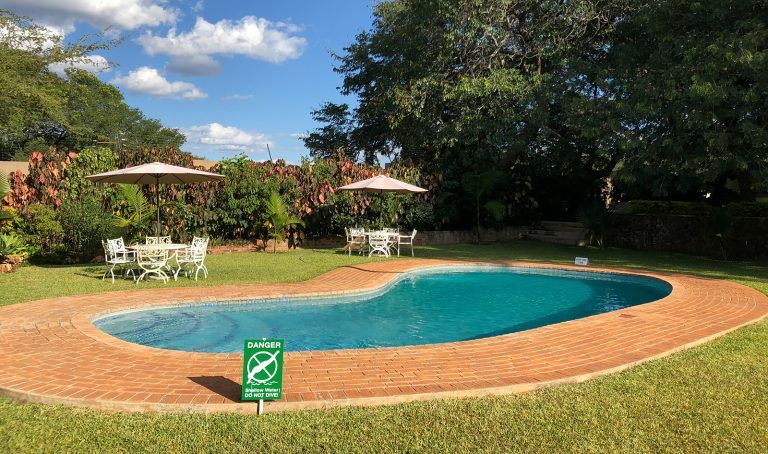 The staff was extremely friendly, like all Zimbabweans (they are all very proud of their country) and the rooms and garden just great. Recommended by the Batonka staff we took a taxi to the Safari Lodge at about 5 pm. The taxi prices are moderate but you should agree on the price before. 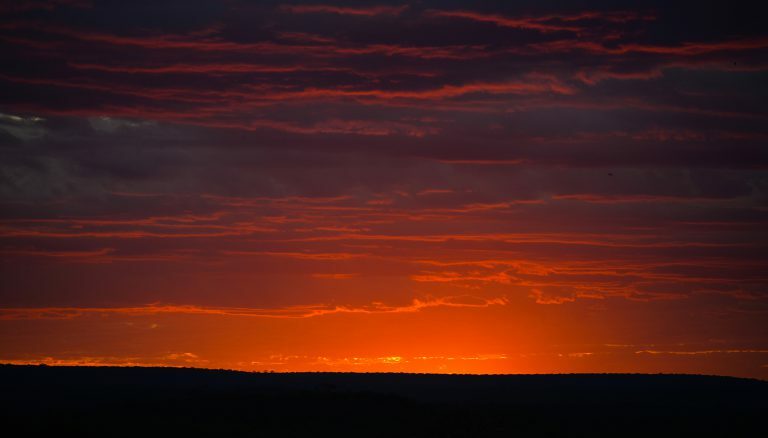 The Safari Lodge offers spectacular sunset views. Really a first highlight and just in time. Photographically, you should have a tele, preferably 70-200mm with you. If necessary, it also does a cell phone for the moment. Photographically, you should have a telelens, preferably 70-200mm. If nothing else is on hand your phone camera will do it too, but less good of course. Two Zambezi beer later (actually brewed in Victoria Falls) we returned to the hotel having experienced a fantastic sunset. After an excellent 3-course menu in the hotel (definitely worth it) we go to bed, hoping to get our luggage the next day. Day 3: 7 o’clock breakfast and then on foot to the waterfalls. After about 1h with various stops in the souvenir shops to buy caps and T-shirts (both because of missing luggage), we reached Victoria Falls Entrance and 60 USD we were already poorer. For another 6 bucks we borrow rain ponchos and after 2 cheese sandwich and 2 coke for 18 USD we start the tour (nobody said Zimbabwe would be cheap). From Lookout 1 to 6 we only get a bit of spray. After that, it’s more like a cloudburst. The Zambezi floods and about 500mio liters of water per minute thunder down. Spectacular! After about 2.5 hours we go back and walk to the Victoria Falls Hotel. Here time seems to have stopped in the last century. 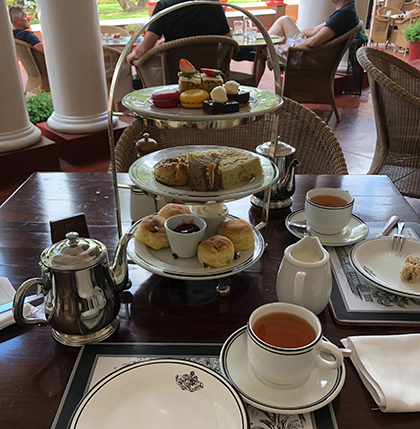 We enjoy the high tea for about 30USD. Highly recommended and a great place to get down and relax. Afterwards we walk back to the lodge. Altogether we saw elephants, baboons and monkeys as well as a mongoose family while walking. Elephants – wild – so close to a city we have never seen before (during the day and on foot). Incidentally, Victoria Falls can be explored very well on foot and is generally considered safe for tourists. As always, caution is required abroad. We had no problems and everyone was helpful and nice. Back at the guesthouse, we are told joyfully that our luggage has arrived. A dream comes true. Day 4: We wake up early and decide to go to the Lookout Café. The fresh elephant dung along the way shows that we are not alone. Nevertheless we do not do any sighting. When you arrive at the café, you feel like you are standing at the entrance to paradise. We have never seen such a majestic view before. The Zambezi floods and the rock walls are golden yellow bathed in the rising sunlight. No one else is there except us and the staff. We order 2 coffees and enjoy the view. The Lookout Cafe: An absolute must for any photo enthusiast and definitely a “must see” when visiting the Victoria Falls. Tip: At full moon in the evening go there (make reservations! ), Because then the moon rises over the gorge. For the way back we use the free shuttle. We are picked up punctually at 11:30 and taken by bus via the border station Kazangula to Botswana. The entry is as always an adventure with many stamps and nonsensical rules (everyone has to step on an old mat with disinfection to clean the soles of the shoes, which are much dirtier afterwards than before). At about 1pm we reach the Kubu Lodge. 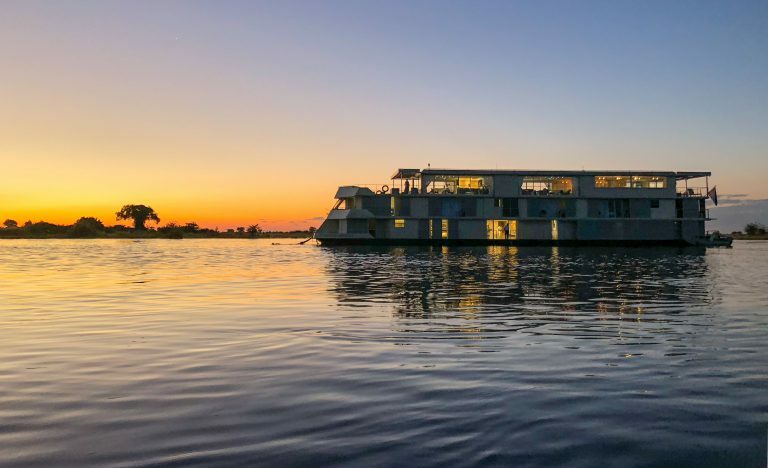 A 30-acre area, right on the Chobe River. The garden is a dream, the lodge rather not. For the price clearly not worth it. Luckily for one night only and Trip Advisor alerted us. 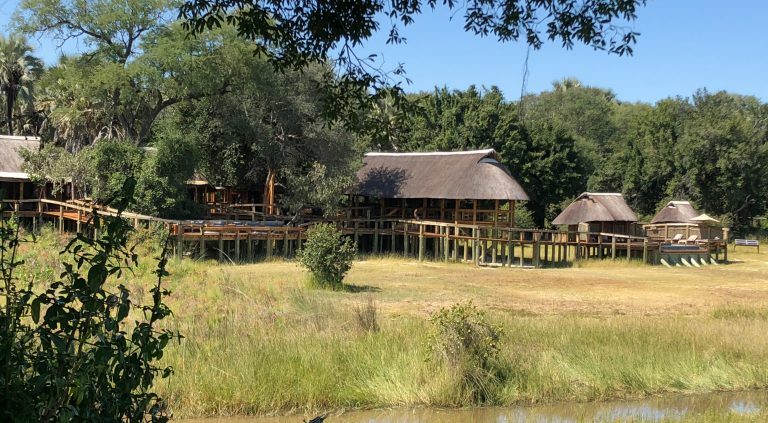 Tip: If you have the necessary money, you should stay at Chobe Lodge, but then at least 2 nights. At 3 o’clock we go on the first safari tour. The highlights are the sighting of a black mamba and the realization that some people simply should not go on safari. What happened? A woman who told us previously that she has balance problems, wanted to photograph a lioness, which 10m away from our car passed by. Suddenly there was a “BANG” and then the lady was already lying next to the jeep. Fortunately, on the side facing away from the lioness, so that the lioness just continued after a short stop. …. For this reason again the basic rules for a safari: Stay in the car, unless the guide allows getting up and definitely not “hanging out” or trying to climb the car. Day 5: Gegen 7:00 Uhr ist die Nacht zu Ende. Wir packen und gehen Frühstücken. Anschließend laufen wir ein wenig im Garten rum, beobachten einen Fischotter und um 12:30 Uhr werden wir abgeholt und nach Kasane gefahren, wo wir die abenteuerliche Grenze von Botswana nach Namibia erreichen. Hier werden wir schon von einem Mitarbeiter der Zambezi Queen erwartet. Irgendwie hatte man sich die Grenzstation am Fluss anders vorgestellt, aber es geht auch so. 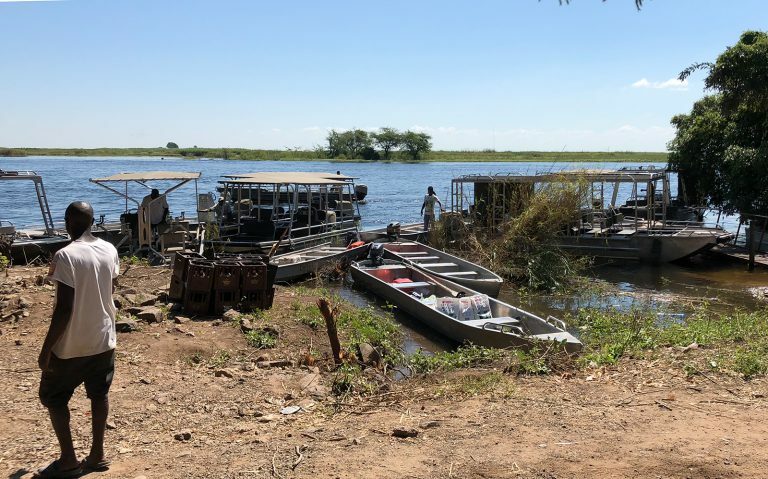 After about 20 minutes by tender boat we reach the Namibian border station on the other side of the river. Again, adventurous and the official wearing sunglasses is even cooler than a bucket of ice cubes. You do not want to have a problem here. Back on the tender boat we drive about 10 minutes, then we see the Zambezi Queen already majestically in the river. A 5 star ship without question. Pure luxury, everything bright, friendly and clean. After a safety briefing lunch is served, then we rest and unpack and at 4 pm we go on the first boat safari. 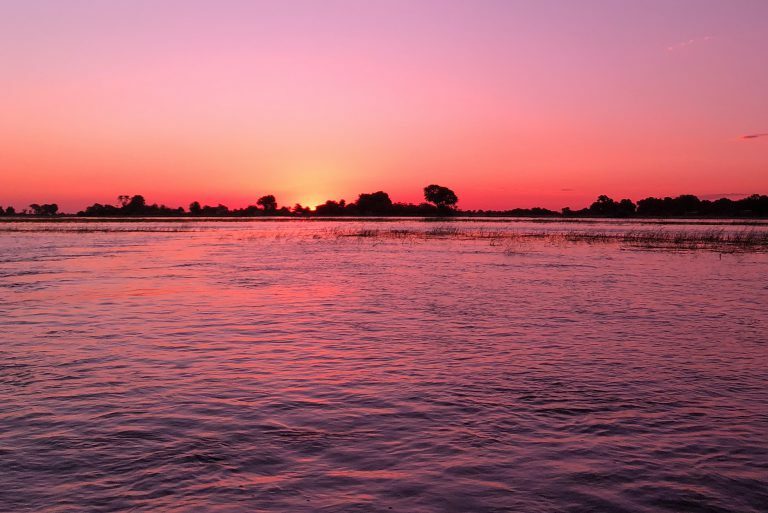 Dreamlike speedboat ride over the Chobe River. The sunset on the water is spectacular. Back on the boat we have dinner and beforehand a speach by Bernard, our guide, about Namibia. The food is – as expected – delicious and after a few glasses of wine you can end the evening relaxed. Day 6: At sunrise, we go on deck for a first coffee. Another dream day. At 7:00 clock starts the Birding Tour. We are only two. The birdlife on the river is incredible. Particularly fascinating are the ospreys, of which there are plenty and the Kingfisher in all variants. Definitely join the birding tour. Many guests still want to sleep at the time and you are traveling in a small group. The photo opportunities are numerous and the light is priceless beautiful. At 9:00 o’clock we are back on board and we have breakfast. At 10 o’clock there will be a tour in a Namibian village. We skip this and stay aboard, where we enjoy the short trip to the next landing station and just do nothing. If you are looking for the “hair in the soup” of this part of the holiday, we are a bit disappointed that the ship is not – as expected – the whole day cruising up the river, but only about 10 km and then moored to a mole again. Driving would be much nicer, but probably not possible because of the flood. The view from the new anchorage is again spectacularly beautiful. In the afternoon we continue with a water safari in a speedboat. Lots to see, hippos, eagles, ibises, crocodiles and a lone Cape buffalo. At 6 o’clock, after another beautiful sunset, we are back on board. Unfortunately, the last night on board. A small tip: you should never aim the mosquito spray on the smoke detector, unless you want to get to know the captain in underwear in the evening at 10pm. Day 7: As usual on cruise ships, the luggage is picked up at 09am and we have until 09:30 clock time. 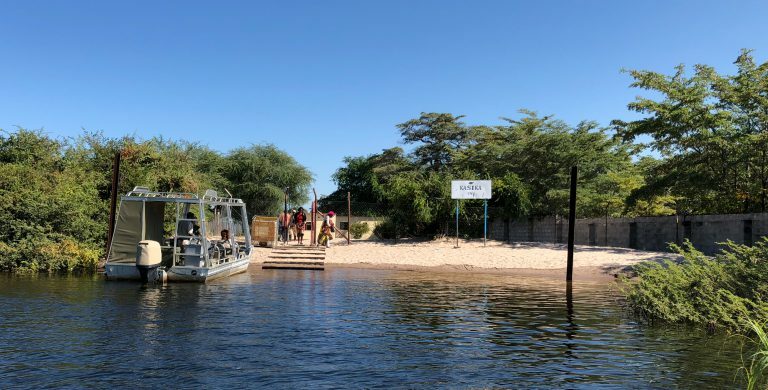 Then it’s time for the tender boat and it’s time to say goodbye to the Zambezi Queen. Same procedure as 2 days ago, only this time in reverse order. Departure Namibia and entry Botswana. The whole thing annoys a bit. From the customs we are taken directly to the airport of Kasane. The journey takes just under 10 minutes and a member of staff from Mack Air welcomes us and takes over the check-in of the two bags. Mass? Nobody asks. Sizes? Do not care. Tip: Basically you should stick to the specifications of the airlines, but they do not take that too serious, if you do not have a hard case with you. We were a total of 10 people boarding a single-engine Cesna 208 with a pilot from New Zealand. 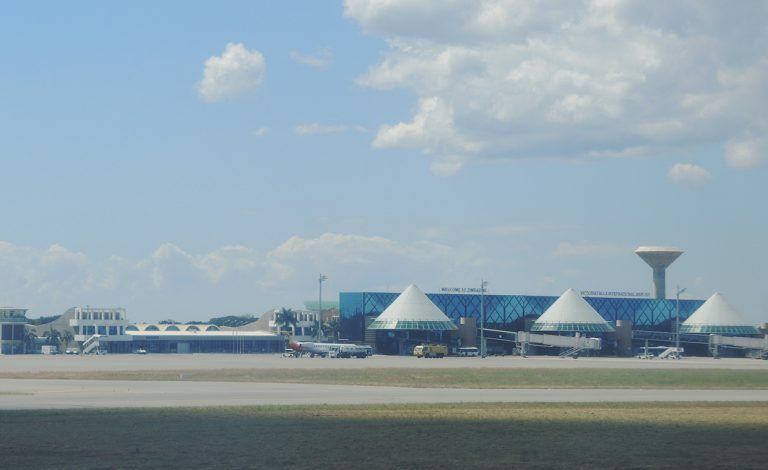 The start is fast and with a left turn over Kasane we fly to Chobe Lodge. After a good 65 minutes in total, we land on our airstrip. A staff member from Ghoha Hills welcomes us with cool, damp towels and fruit pies, then we head to the lodge. Again about 45min ride. The lodge is really nice. After a light lunch, we rest a little in the comfortable armchairs. At 4pm high tea and 4:30 o’clock it starts with the first mini safari to the Sundowner. Nothing spectacular, but OK.
Day 8: Today is completely “holidays” and rest. 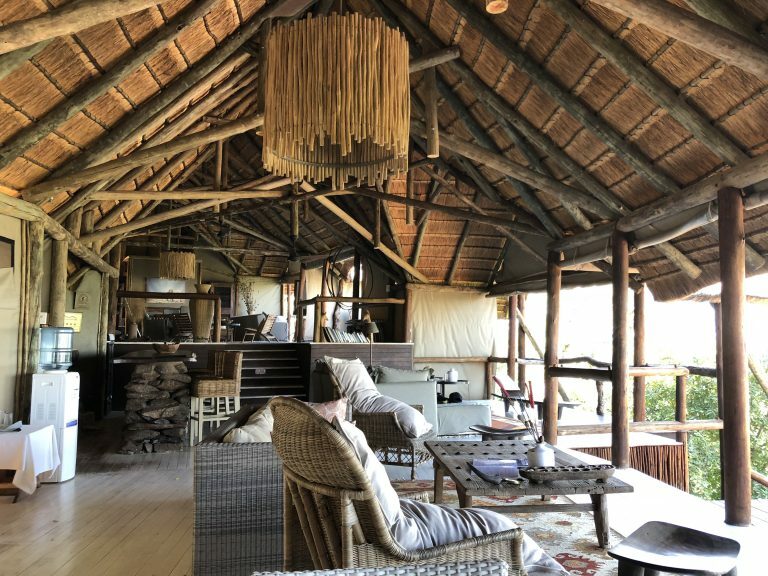 We stay in the lodge all day and I take pictures and film the house squirrels … High Tea at 4pm and then Sundowner Game Drive at 4:30 pm, this time to the hide of the lodge. The hide (rather a shelter) of the lodge is located at a small lake. Very idyllic. Day 9: We have the safari car all to ourselves. At 06:30am we get going. 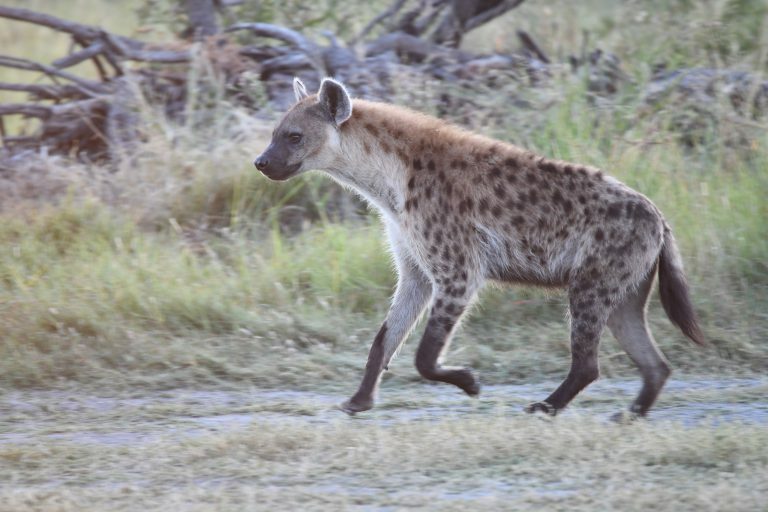 After a good hour’s drive, we arrived in the Savute area of ​​Chobe Park and see many zebras, wildebeest, a secretary bird (highlight) and after much driving 2 Cheetahs hidden in high grass. The information reaches us that 3 lions have killed a zebra and we are on our way. When we arrive, the zebra is already dead in a bush and we do not see much. However, for the “photo session” the lion and a lioness come out. After that it’s lunch outside. Rem, our guide, prepares everything in the middle of the bush. A great experience, especially as we are surrounded by zebras and giraffes. Afterwards we drive back to the lodge where we arrive at 2pm, we are pretty exhausted. 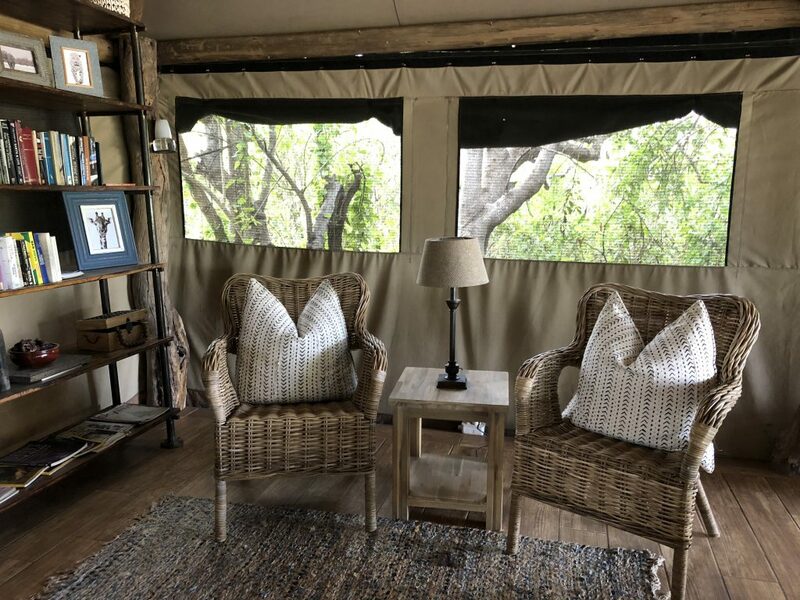 Tip: The difference with Ghoha Hills to other lodges is that you make a very long game drive per day (about 7-8h) and in the evening a shortened sundowner (about 1.5h) The dinner with Lean & Elmarie Marnewick, the manager Couple, is very nice again and we enjoy the last evening. Day 10: After breakfast we are driven by Edwin to the airstrip. Suddenly everything is back up fast. Punctually at 10:30 am our plane lands. Suitcases in, get in and we’re in the air. 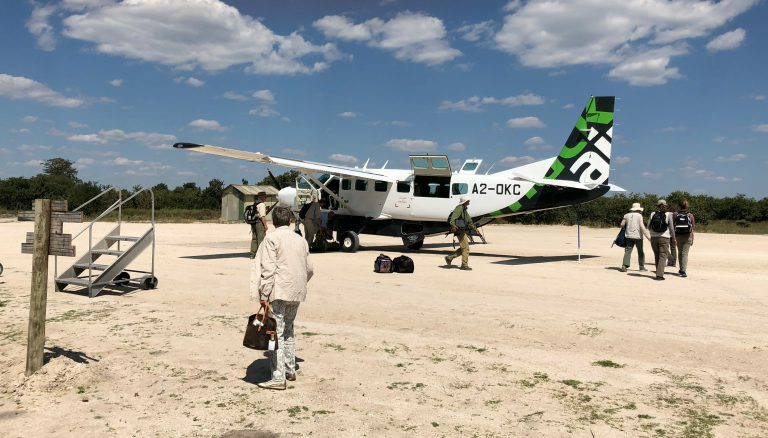 25min later we land directly next to Camp Okavango. Ernie, the manager, welcomes us in a friendly manner. 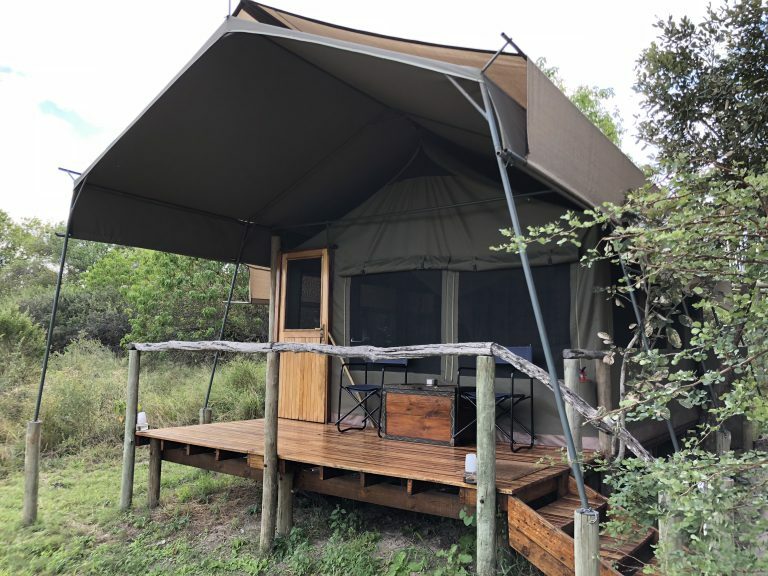 The camp is newly opened in March 2016 and very well equipped, except that for the first time it is really “off” as there is no wifi or phone reception. In the afternoon we go with Mec, our guide, on a boat safari. The boat ride is great, but without highlights as far as animal watching is concerned. Dinner is good, but not as good as Ghoha Hills. 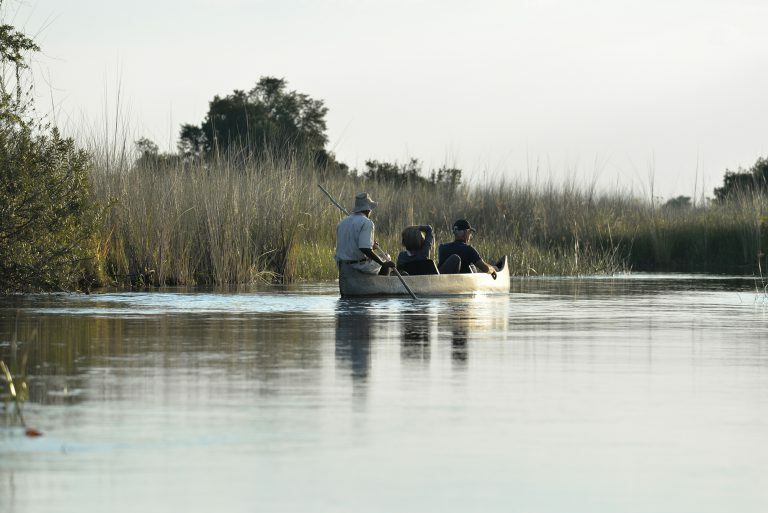 Day 11: At 07:00am we sit in the boat for our walking safari. We walk 5 km through the bush, which is good for our fitness after days of gluttony. But everything we see (hyenas, antelopes, elephants, etc.) is far too far away to photographically make anything out of it, unless you’re carrying a 600mm telephoto lens. At about 11am we are back in the camp and have brunch. We are really hungry now. Tip for photographers: Just leave the camera in the camp and enjoy the walk. At 4pm we take a tour with the mokoro, the boat of the locals. At first I’m skeptical, but the mokoros are comfortable and you glide silently through the delta, which helps to see shy animals. Just try it. 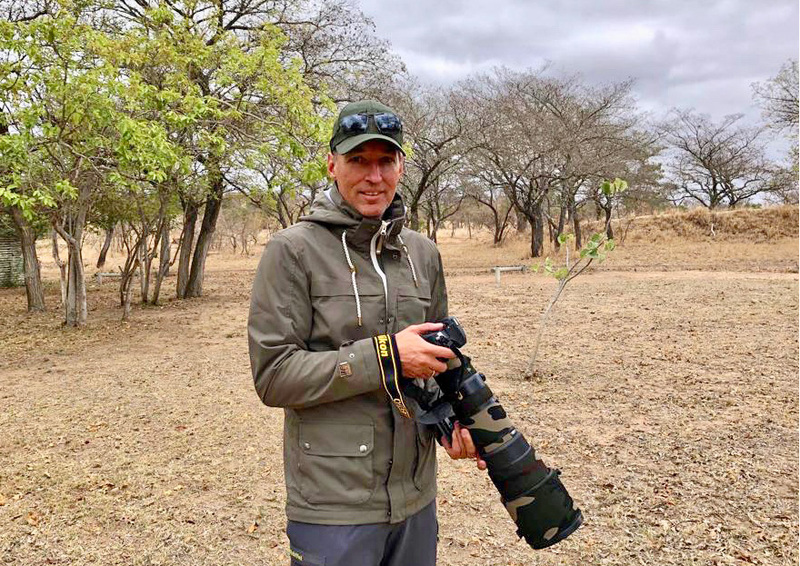 While one should simply leave his camera in the camp for the bush walk and enjoy the walk itself, you should definitely do a tour with your camera in the Mokoro, as it glides silently through the water and you get very close to the animals, especially birds. At first I’m skeptical, but the Mokoro is comfortable and you glide silently through the delta. he sundowner is then at the jetty and afterwards it goes on foot to the lodge. The dinner is again very entertaining, as the staff with each food recommendation speaks a loud “Mmmmmhhhh” to itself. Funnily funny. After a last red wine under a brilliant sky, it goes to bed. Day 12: At 06:30am we take another boat safari, this time with Karl. The tour is awesome. 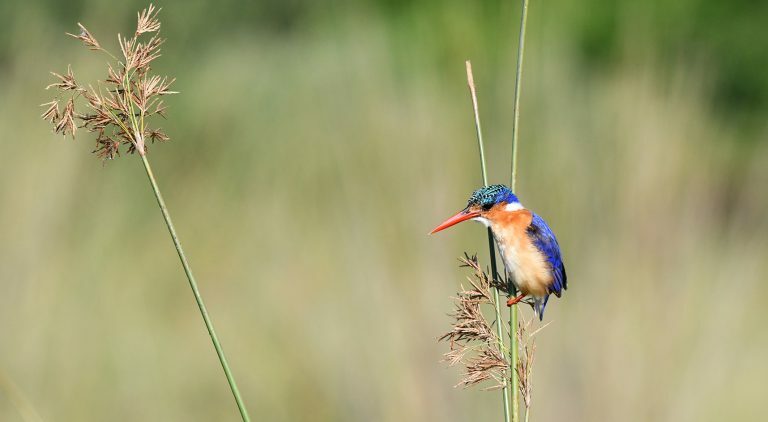 We see elephants, antelopes and many birds, but especially the malachite kingfisher. 3 hours later we are back. Fast, shower, pack, have breakfast and at 11:15am we sit again in the plane. This time a young lady pilot with Rasta hairstyle. Very cool! The machine is great, too. Nice with leather chairs. Purest business class. After 20min flight we land in Khwai. Another 25min drive later we arrive at Camp Sango. Total max. 12 guests and very familiar, not luxurious but nice. We have tent No 1and the best view. The note from Mike, one of the managers, that the tree next to our tent was “executed” by Elephant’s raises questions. No matter. First unpack and at 3pm there is high tea again. Until then, I watch the elephants, which are about 200 meters away from our “porch” in the grass. At 4 pm our first jeep safari since days starts. Our guide is “BK” a very young ranger. But with 10 years of experience. 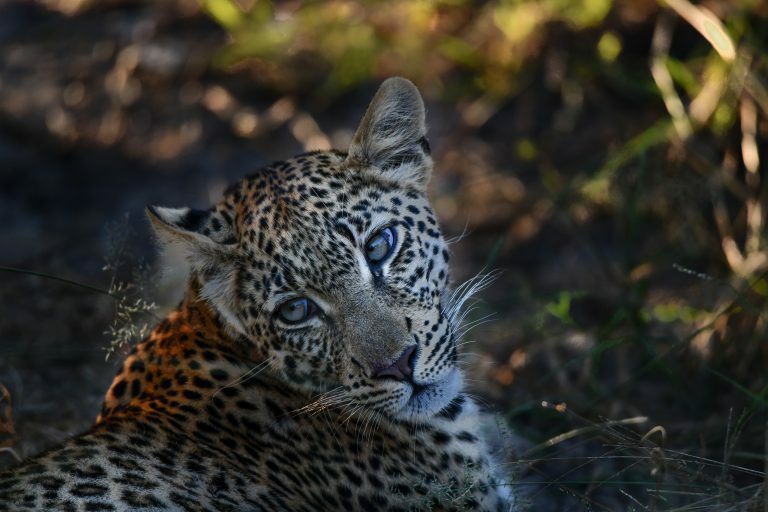 After a relatively short time we see a young Leopard. Everything that comes after that is only an accessory. At 7:30 pm we are back at camp and looking forward to dinner. At 9:30 pm we are in bed and can hear the hippos that are in the water not far from the tent. Day 13: We wake up at 05:30am. It is much cooler than usual and getting up is difficult. Nevertheless, we manage to catch ourselves at the campfire for breakfast and at 06:30am we start the first drive of the day. Right at the beginning a spotted hyena and a short time later a leopard. How much better can a day start? Only the lions we do not find. After a coffee at the waterhole we start the way back. The time until 3:30 (High Tea) we spend watching the numerous elephants, who eat the green grass on the riverbank directly in front of our veranda and do not let anything disturb us. The evening game drive is very nice again. Elephants, Impalas and more. Day 14: As always, wake up at 05:30am. 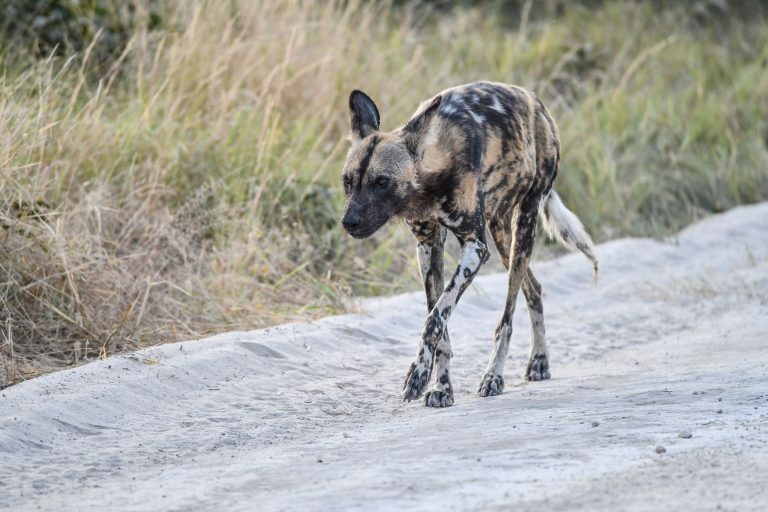 On the way we get the information that wild dogs were spotted. BK “races” through the bush. Unfortunately, I do not have my sunglasses on, when I feel a fist-sized beetle pops into my right eye. Ouch! That hurts the whole day. After about 30 minutes we reach the Wild dogs. That’s an impressive animal. However, they are lazy and full. The blood of the last Impala still in the fur they rest on the road. Since we are alone in the car, we afterwards go back to the lodge, see some rare antelopes and impalas. At 3:30, there is again high tea and then starts starts again from 4pm. After about 30min comes the info, that “Umkwe” (leopard on Sizzua) was discovered, with a just killed Impala. As we arrive there are already 6 other safari cars on site. It’s a bit crowded, but BK ensures us a good position. We spend a good hour, then take our sundowner and drive back to the lodge for the night. On the way a big Giant Eagle Owl and on the river crossing we have to wait, because a Hippo Baby plays with his mother right there. Day 15: Departure. 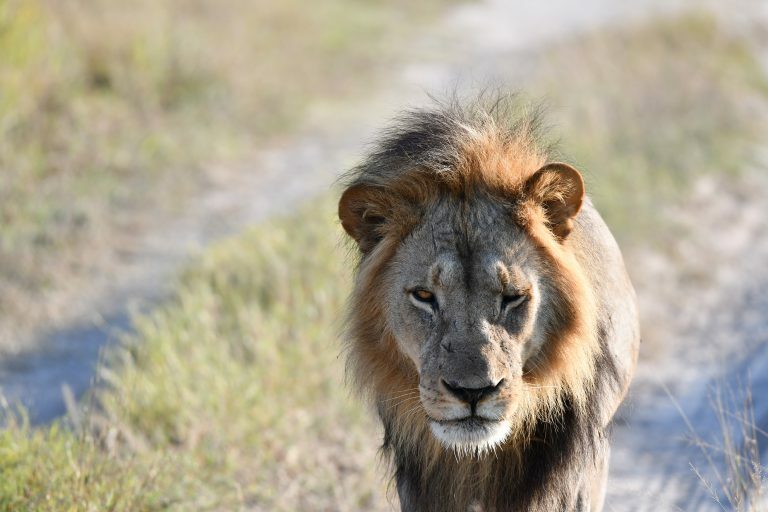 One last game drive and we see one of the male lions, because this time we drive directly to the Moremi Reserve. This is really a highlight to say goodbye. Back in the lodge it’s time to pack again, take a shower, have breakfast and leave for the airstrip at 11:15 am, to our last bus pilot to Maun. The waiting hall for the departure to Johannesburg is a bit adventurous. At 2pm our flight takes off. In Johannesburg we have to do immigration to South Africa as normal, get our luggage and check in again for Munich. Quite awkward. At 6:45pm is boarding. Certainly not our last trip to Africa. 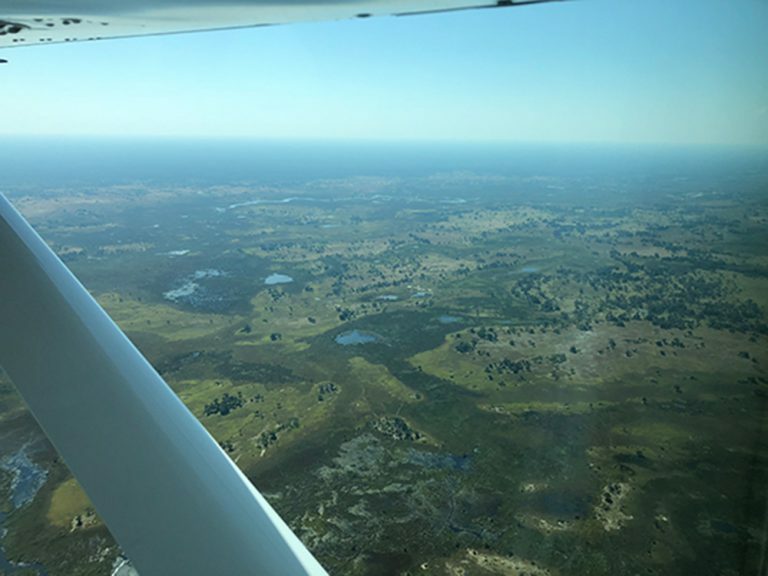 A few thoughts: In Botswana and Zimbabwe – unlike in South Africa or Namibia – it is advisable, for time and many other reasons, to make such a tour by light aircraft. There are hardly any gas stations and the roads are usually extremely bad. It should be clear that most lodges are really far from any location. Therefore always pack a good first aid kit. We do not need a lot of luggage (we have had too much), because you can wash in all lodges (also underwear) and mostly free of charge. Depending on the season, it can be chilly, so always think of the “onion principle” in clothing. Mosquito spray is also available in all lodges. It is enough to take a small “reserve” with you. Whether you want to take malaria prophylaxis, everyone must decide for themselves. We did it, but we hardly saw any mosquitoes at that time. Another final tip for the photographic equipment. Long telephoto in any case, ideal are 300mm or more. In addition and actually enough a fast light zoom (for example 24-70mm or the cheaper 24-85mm from Nikon). You do not need more, especially not if you have a good smartphone with you. For those who found the article helpful: If you want to support my work, just purchase my calendars etc. Many Thanks !